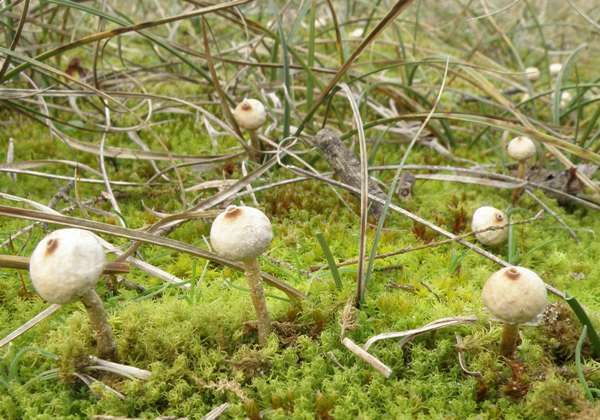 Tulostoma brumale, the most common of the stalkballs, is an autumn and winter species found among moss or short grass mainly on sandy, alkaline soil. The dune slacks just behind the first stable sand dune ridges are usually good places to look out for these strange, almost other-worldly little fungi. In older texts the stalkballs are commonly referred to as 'stilt puffballs', and it is now known that puffballs and stalkballs are close relatives. 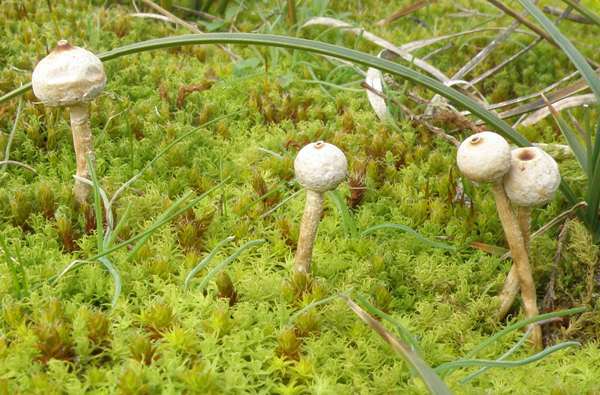 What is even more surprising about stalkballs and puffballs is their genetic proximity to edible fungi such as Field Mushrooms and Horse Mushrooms (Agaricus campestris and Agaricus arvensis) and the like; to the Parasols Macrolepiota procera; and to the various (mainly poisonous) dapperlings in the genus Lepiota. All of these now belong to the recently enlarged family Agaricaceae. Tulostoma brumale is the most common of the stalkballs that occur in Britain and Ireland. It is seen more often in southern England, Wales and Ireland and becomes increasingly rare further north. The Winter Stalkball occurs also throughout mainland Europe from southern Scandinavia right down to the Mediterranean coast and the Iberian Peninsula. I see these little fungi far more frequently in coastal sandy parts of southern France and Portugal than in Britain. This species was described scientifically in 1794 by Christiaan Hendrik Persoon, who created its basionym when he gave the Winter Stalkball the scientific binomial name Tulostoma brumale by which mycologists still refer to it today. The generic name Tulostoma comes from tul- (or tyl-) meaning a swelling, or the knob on the end of a club; and the suffix--toma meaning with wool or hair (just as tomentose means woolly). So fungi in this genus should look like rather woolly or hairy balls on the ends of clubs. Well, the Winter Stalkball matches that description reasonably well. The specific epithet brumale means 'of winter', so that seems to work well too! This lollipop-like fungus is easily overlooked among snail shells and other pale debris. The rounded 'puffball' with its slightly granular surface sits on a twig-like stem arising from a brown basal volva. 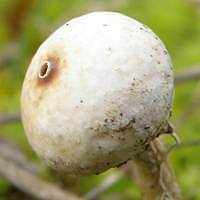 Both the spore sac and the stem are white or greyish, the stem covered with brownish longitudinal fibres. The spore-release hole (peristome) is surounded by a reddish-brown ring. Ball diameter varies from 0.5 to 1cm, and the total height ranges between 2 and 5cm. The stem is 0.2 to 0.3cm in diameter and 1.5 to 4cm tall, tapering slightly towards the apex; it can be smooth and grey or more often fibrous and mottled grey-brown. Inside the spore sac the gleba is white and firm initially, turning brown and powdery as the spores mature. Subspherical to globose, 4-5 x 3.5-4µm; covered in fine warts. The powdery spore-bearing gleba is pale rufous (reddish). Saprobic, found in stony and sandy soil among moss or short grass, most commonly in coastal areas. September to January in Britain and Ireland; often persisting through to March in Southern Europe. Tulostoma melanocyclum, the Scaly Stalkball, is very rare in Britain and Ireland. Somewhat smaller than the Winter Stalkball it grows in sand dune slacks and has spores much larger than those of Tulostoma brumale. Tulostoma niveum, the White Stalkball, is very rare in Britain and Ireland. This tiny stalkball has a smooth white ball with a protruding apical peristome; it grows on mossy limestone boulders in upland regions and is recorded very infrequently in Scotland. 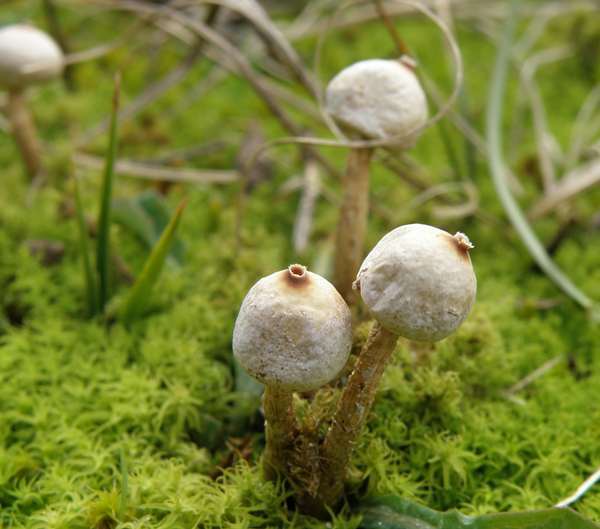 These tiny fungi are generally considered inedible, and in any case they are too insubstantial to be of any culinary value.